The faculty and staff of Connecticut Dance! welcome you! If you're an established dancer, or just wanting to get started and do not know where or how, we will be more than happy to help guide you. We accept students from pre-school through adults, from beginner to professional. Classes are offered in creative dance, pre-ballet and tap, classical ballet, pointe, jazz, tap, lyrical, modern, hip-hop and Irish step. 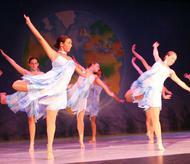 We also offer extra performance opportunities within our Performance Troupe division of our school! All of this is done in a nurturing, non-competitive, family oriented atmosphere. What more could you ask for? Come back and visit our site often. There's always something exciting at Connecticut Dance! Click "Contact Us" for more information! Having two daughters dance at CT Dance for a combined 20 years was amazingly fulfilling. CT Dance was, for my daughters, a home away from home, a place to follow their passion, to learn and practice many types of dance in a professional environment while also being nurtured by a loving group of women who care deeply about the development of each young dancer. Not only was the art of dance taught, values such as: self-discipline, hard work ethic, empathy, kindness, and community consciousness, were always instilled by the instructors at CT Dance. CT Dance was the single most positive influence in my daughter’s life during her formative pre-pubescent years all the way through her senior year of high school. The level of rigor and professional training also allowed her to continue to dance at the university level, participating in a university affiliated dance company. My daughter, who is currently dancing with The Washington Ballet, began dancing at CT Dance at the age of four and continued there through high school. Not only did they teach strong technique but they also instilled in her the passion of this art form and gave the support and encouragement to pursue her dreams! If you are considering Connecticut Dance for your child, I highly recommend it! The art of dance and Connecticut Dance itself have been a gift in our lives. My daughter made life- long friends, the studio became home and she became a beautiful dancer. That blessing spread and I have wonderful dance mom friends. This letting go thing is hard. It’s been a great 13 years! ​We will be open for classes today at 1:30. Hope to see you there as long as it is safe to travel from your location!